This landfill contained a wide range of wastes and was subsequently restored for use as public open space. Prior to remediation, waste materials were often exposed at the surface posing a risk to the general public. High concentrations of TPH contamination also posed an ongoing risk to controlled waters. It was proposed to redevelop the site as a new school including high quality playing fields. VertaseFLI designed a remediation scheme to achieve the geoenvironmental objectives, maintain an earthworks balance and minimise the environmental impact on this sensitive site. The former landfill was fully delineated and zoned based on waste types contained therein. Vegetation clearance was preceded by ecological surveys. An area of Japanese Knotweed was isolated and subjected to ongoing herbicide treatment. Topsoils were removed and subjected to screening where required. 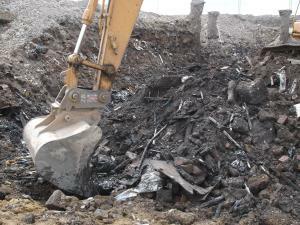 Selective excavation of wastes, classification and processing was undertaken. This required a multi approach to screening including trammels, grizzly bars and three way screeners and picking stations. End products were also blended to produce a competent geotechnical material. The site also contained significant quantities of soils containing high concentrations of TPH which were subjected to ex-situ bioremediation. An adjacent stream was thoroughly cleaned and protected during the works. 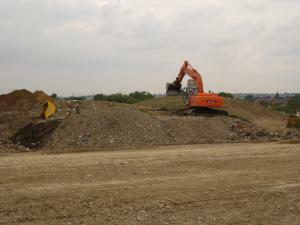 This was one of the earliest landfill reclamation projects and whilst the physical works employed traditional methods, a main challenge was environmental legislation, especially in respect of waste and the reuse thereof. VertaseFLI were instrumental in demonstrating and obtaining approval to reuse wastes including hazardous wastes, under exemptions from the Waste Management Licensing Regulations. Through extensive negotiation, risk assessment and sustainability arguments, we obtained regulatory approval to reuse wastes and hazardous soils as part of the remediation works.